The holidays are upon us and most likely you will be having people or family over for dinner. Instead of doing the same ole fold the napkin in 4, I have an easy and different way to fold your napkin. Let me introduce you to the cone. There are a few steps but it’s pretty simple. I am using a graphic line print napkin called Kyoto which I think adds to the wrapping of the napkins. 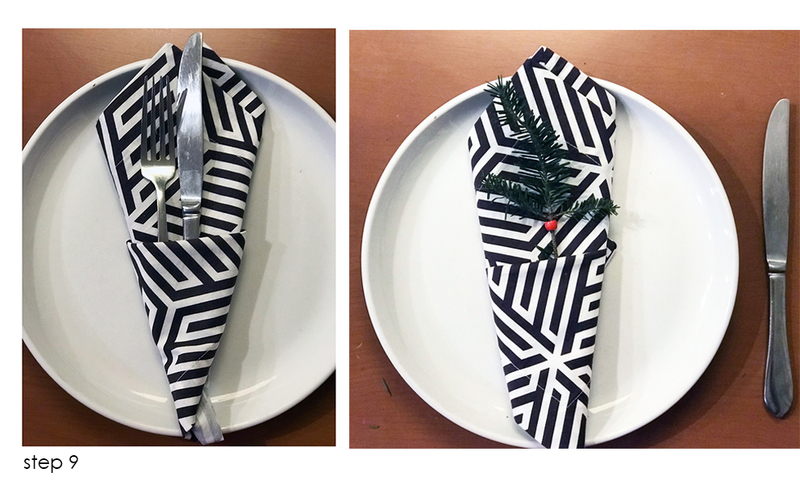 STEP 1: Lay out the napkin face side up. STEP 2: Fold it in half. STEP 3: Fold in half again matching up the corners. STEP 5: At the top point, fold one layer down to the bottom point. STEP 6: Flip the napkin to it’s opposite side. Just turn the whole thing over. STEP 7: Fold the left point (9:00) to the right. STEP 8: Fold the right over to the left and flip over to the backside exposing our new pocket in the shape of an ice cream cone. You can either put your silverware in the pocket, name tag or something to celebrate the time of year. I chose a pine branch since we are setting up our Christmas tree and we have a few to spare. Also I stole a bead from Harper’s collection and slipped it over the pine branch to add a little color. Some other ideas are holly branch or a candy cane. Why Organic Cotton is Important?